Growing up, I thought beets only came from a can and were only ever offered at the salad bars of the 1980s and '90s. My mother would gather up her iceberg salad with Thousand Island dressing, canned beets on the side. As she ate, the salad would gradually turn a more ghastly shade of purple. To me as a kid, it was the most unappealing thing, bordering on traumatizing, and I decided to hate beets forever. Fast forward to today. Thankfully I've learned that fresh beets are a thing. A fascinating, jewel-toned, earthy-flavored thing. They're widely available this time of year. Lo and behold, I even like beets in salads. Mind you, this is a much different kind of salad than the nightmarish ones of my childhood memories. 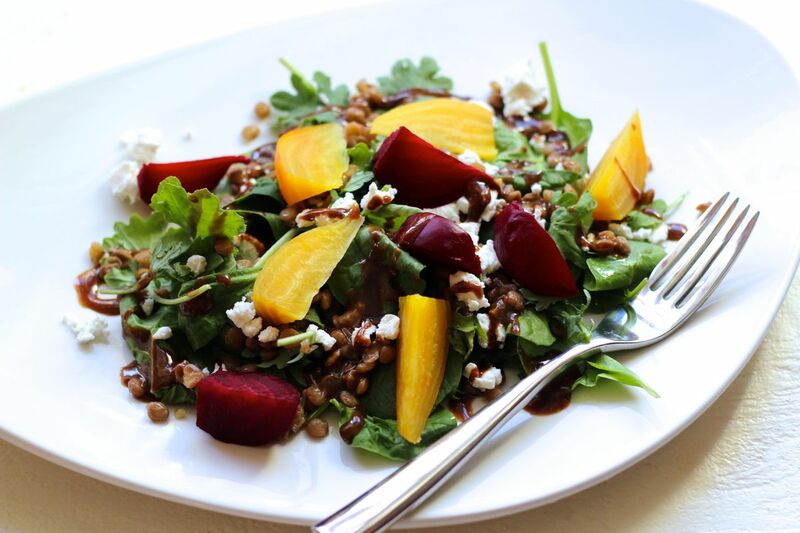 We're talking about tender baby greens, nutritious lentils, crumbles of goat cheese. Because, along with discovering fresh beets, I discovered somewhere along the way that they are perfectly paired with goat cheese, one of my favorite things. But if you'd prefer to make this recipe vegan, just omit the goat cheese. I've topped it all with a tahini-maple dressing. This beet salad is much more beautiful and appetizing than the stuff of my past and with this recipe, a tragic food memory has come full circle. Tip: to get beet juice stains off your cutting board, countertop, or fingers, use fresh lemon juice. I like to slice a lemon in half and just rub it onto a stained area. Fill a medium saucepan with water and salt the water generously. Bring the water to a boil over high heat. Add the lentils and stir so they don't stick to the bottom. Turn the heat down to medium and cook the lentils about 20 minutes, until tender. Drain the lentils and rinse them in cold water to cool. Refrigerate until ready to use. To make the dressing: add the oil, vinegar, tahini, mustard, maple syrup, garlic, and salt in a small mixing bowl. Whisk together until smooth and combined. To assemble the salad: place the greens on a serving plate. Top with lentils and beets. Sprinkle crumbled goat cheese over everything. Drizzle with tahini dressing.